There are two locations that turn men into Marines: the Recruit Training Depot at Parris Island, South Carolina, and the Recruit Training Depot at San Diego, California. Where you go depends largely on where you enlist. Those who enlist west of the Mississippi will likely go through boot camp in San Diego, while those in the East will attend at Parris Island. There is only one boot camp that turns women into Marines: Parris Island. 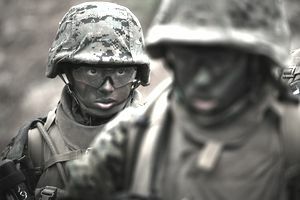 Marine boot camp is considered more challenging, both physically and mentally, than the basic training programs of the other military services. There are more than 70 training days in a period a little longer than 12 weeks. It has been said time and time again by former Marines that Marine Corps recruit training was the most challenging thing they ever had to do in their entire lives. The more you can prepare in advance, the better off you will be. It's essential that you try to get into physical shape. Concentrate on running three miles and long marches (up to 10 miles). Sit-ups and pull-ups are also important. If you are unable to perform basic exercises, you may spend a significant amount of time in the physical conditioning platoon, or PCP. In Marine boot camp, you'll start drill almost immediately. A few hours studying basic drill and ceremony will help immensely. As with the other services, you should memorize U.S. Marine Corps Rank. Additionally, your recruiter should have told you to memorize the 11 General Orders for a Sentry. While not mandatory, the Marine Rifle Creed is nice to know. You should also memorize the Marine's Hymn, all of it, if possible, but at least the first verse. You'll need to memorize the USMC Core Values, study Marine Corps history, and commit the characteristics of the M16A4 Rifle to memory. Round all of this out by memorizing the Code of Conduct. If you don't know how to swim, try to learn before you leave for boot camp. Before you graduate, you'll have to demonstrate basic swimming skills. Don't bring anything with you to boot camp except your important papers (such as driver's license, social security card, and banking information), and the clothes on your back. Everything you need will be issued to you. For non-issue items, it will be issued, and the cost taken out of your pay. Over-the-counter medication is not allowed in basic training. If you bring any with you, it will be taken away. All prescription medication will be re-evaluated by a military doctor upon arrival. If the doctor determines that the prescription is necessary, the civilian medication will be taken away, and the recruit will be re-issued the medication by the military pharmacy. This includes birth control pills (for women). Women are usually encouraged to continue taking birth control pills during basic training, if they took them before going to basic, to maintain their regular cycle. Pads and tampons are readily available, and women use them and continue with training. Bathroom breaks are given often enough that changing pads or tampons are not a problem. The first stop is at Recruit Receiving, where recruits spend the first few days of their recruit training experience. Here they will receive their first haircut and their initial gear issue, which includes items like uniforms, toiletries, and letter writing supplies. During this time recruits will also be given a full medical and dental screening, and take the Initial Strength Test. This test consists of a one and a half mile run, sit-ups and pull-ups to test recruits to see if they're in shape to begin training. You'll most likely begin the process late at night, or in the early morning hours. The other services do quick processing and allow you to rack out for the rest of the night. In the Marine Corps, you'll be up the entire first night and all of the next day. During this day and a half, you'll complete paperwork processing and will be issued initial uniforms and field gear and various needed personal items which will come from the PX. These items will be deducted from your pay. You'll spend between 3 and 5 days in Receiving. To pass (and avoid the Physical Conditioning Platoon), males are required to do two dead-hang pull-ups, 44 crunches in 2 minutes, and a 1 1/2 mile run in 13 1/2 minutes. Females are required to run 1 1/2 miles in 15 minutes, perform a flex-arm hang of 12 seconds, and do 44 crunches in 2 minutes. You cannot wear contact lenses during basic training. You also cannot wear your civilian glasses, once you have been issued your official government-issue glasses. During your first couple of days of basic training, you'll undergo a complete eye examination. If you require glasses to have 20/20 vision, you will be given military-issue glasses, which have thick, hard-plastic frames, with thick, hard-plastic lenses. Once you receive them, they are the only glasses you are allowed to wear while at basic training. However, if you don't need glasses to see, you won't be required to wear them. Once you graduate from basic training, you can wear your civilian glasses again, as long as they conform to military dress and appearance regulations. After your stint in Receiving, you'll be transported to your new home to meet your Senior Drill Instructor and his/her two assistants. Direct Deposit is mandatory for military pay. Unlike the other services, which allow members to have their pay during basic direct-deposited into any bank account, the Corps requires recruits to open up a bank account in the on-base bank or credit union to receive their pay during basic training. It is done during in-processing at basic. Following graduation from basic, recruits can then change their "direct deposit" to any bank account of their choosing. During your in-processing, you will complete paperwork to begin your military pay, which is deposited bi-monthly. Your first paycheck will contain all the pay you have coming to you at that point. For recruits without dependents, that means base pay, only. For those with dependents, it means base pay and housing allowance. A Marine's first paycheck will be "pro-rated" to the number of days of active duty. For example, if you receive your first paycheck 30 days after arrival, you will receive the full-rate of the monthly basic pay in that paycheck, and (if you have dependents), the full rate for the monthly housing allowance. Basic Training is broken down into three basic phases: The first phase is Basic Learning; physical and mental. The second phase is Rifle Training, and the third phase is Field Training. The first part of week one is called "forming." The Drill Instructors form recruits by a process known as total immersion. Forming is the period when recruits are taken to their training companies and meet their drill instructors for the first time. During this period, recruits learn the basics: how to march, how to wear their uniform, how to secure their weapon, etc. This period allows recruits to adjust to the recruit training way of life before the first actual training day. Drill instructors are not supposed to use profanity, nor are they allowed to physically touch a recruit (other than for safety reasons, such as on the weapon range). So, how do they maintain discipline? In the other services, it may be push-ups, or possibly some running. In the Marine Corps, you get "quarter-decked." Your three drill instructors work as a team. The senior D.I. gives most of the commands and orders. The second hat singles out those who seem to be having problems and the third hat administers the physical discipline, known officially as IPT (Incentive Physical Training), unofficially known as "quarter-decking." IPT consists of prescribed exercises (a maximum of five minutes outside in "the pit," no maximum inside). Exercises one can expect if one is "quarter-decked" are: bends and thrusts, leg lifts, side lunges, mountain climbing, running in place, side straddle hops, and push-ups. Drill instructors use a combination of individual and group IPTs to keep the platoon on its toes. Almost every single day of Marine boot camp you'll experience Physical Training (P.T.). This normally consist of six limbering exercises, followed by the "daily dozen" (side-startle hops, bends & thrusts, rowing exercise, side benders, leg lifts, toe touches, mountain climbing, trunk twisters, push-ups, bend and reach, body twists, and squat benders), up to 15 reps each, and up to three sets of each. It is in addition to required runs and long-distance marches. Recruit training uses a progressive physical training program, which builds up recruits to Marine Corps standards. Recruits will experience Table PT, a period of training in which a drill instructor leads several platoons through a series of demanding exercises while he stands on a table. Recruits will also run, either individually or as a platoon or squad. Other PT consists of obstacle courses, circuit courses, or conditioning marches. In addition to 8 hours of sleep, you'll get some "free time" each day. The purpose of free time is to allow recruits to read, write letters, watch instructional television (ITV), and to take care of other personal needs. It is a period when no training is received by recruits, and no instruction is conducted by Drill Instructors. Free Time is intended to be a relief period from close, constant association for both recruits and DI's and to take care of personal hygiene and other personal needs. The Marine Corps Recruit Training Regulation requires the DIs to give you one hour of uninterrupted free time each evening, beginning on the first training day, while in garrison (i.e., not out in the field), Monday through Saturday, and four hours on Sundays and holidays while in garrison. Company commanders may authorize two hours of free time on Saturdays. However, company commanders may also suspend free time for recruits as a result of punishment imposed by administrative or legal proceedings. Mail is passed out each day by the DI's before free time. The Marine Corps emphasizes close combat training. You'll begin this training during week one with an introduction to bayonet fighting. You'll also experience your first 1 1/2-mile formation run, and be introduced to your M16A4 rifle. During your 13 weeks, you will spend countless hours taking this rifle apart, cleaning it thoroughly, and putting it back together.